A month out from “peak real estate season” in Seattle, and the local market is still not among the hottest in the country. That is, likely, more than alright for a number of home-buyers, who might’ve been burnt out from last year’s market which seemed to go nowhere but up in median price. But it’s also a bit surprising — and not confined to Seattle, according to a new monthly report from CoreLogic. According to CoreLogic’s numbers, Washington’s growth in February 2019 for single-family home prices year-over-year was just 4.6%, only marginally more than the national average, 4%. Both those numbers represent something of a cooldown, according to Dr. Frank Nothaft, chief economist for CoreLogic. That doesn’t mean that housing is suddenly cheap, either locally or nationwide; CoreLogic’s report also looked at the top 50 markets based on housing stock. They found 40% were overvalued, 18% were undervalued, and 42% were at value in February 2019. And according to Nothaft, the peak season is primed for prices to go up even further. And while Seattle had some other things on its mind in February that might’ve contributed to a cool down, local analysts agree that it’s shaping up to be a good season too. After all, even with the Snowmageddon, home prices in King, Snohomish and Pierce counties rose significantly, ending the month-over-month declines that started last May. And as CoreLogic notes in their report, Seattle’s market was considered “at value” in February. “Similar to previous months, prices are moving upwards the most consistently in exurban areas along the Interstate 5 corridor,” James Young, director of the Washington Center for Real Estate Research at the University of Washington, said in the latest Northwest Multiple Listing Service report. 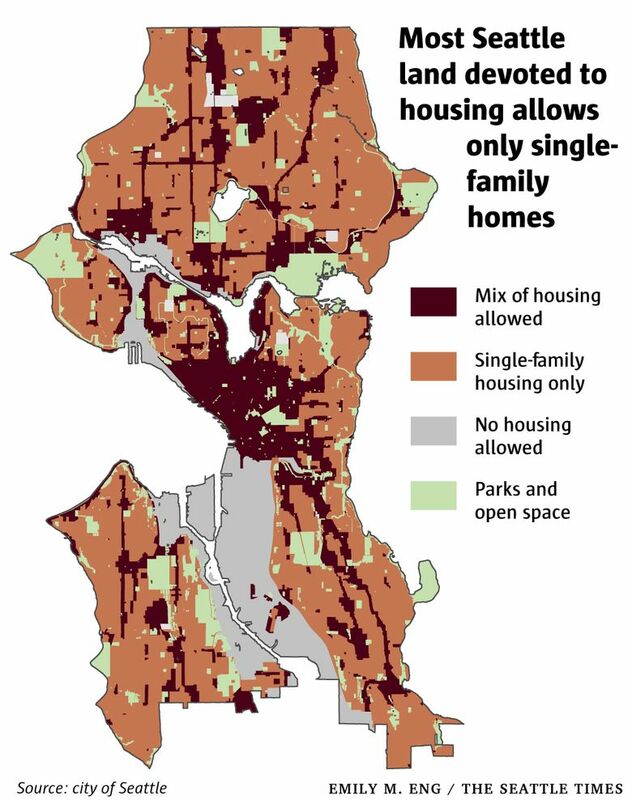 The single-family zones that make up about 75 percent of Seattle’s residential land have accommodated just 5 percent of all new housing added in the city this decade, according to a planning commission’s report released earlier this month. Findings of the report are in my blog from last week. The second part of the report lays out recommendations to help fix some of these issues. The planning commission has no power to make these changes — it must ask the mayor and City Council to do so. The 16-member planning commission, volunteers appointed mostly by the mayor and City Council, is generally made up of professionals in the land-use world — from architects to urban planners to affordable-housing builders. They plan to hold public workshops in different parts of the city to talk about the report’s findings and will work with city leaders to sharpen their recommendations, which were purposely left “pretty vague,” Parham said. The commission advocates for extending existing “urban villages” — places near transit where more development is allowed — an extra quarter mile or so, which would allow more density on the edges of single-family zones. It also wants to allow more “low-density” housing like one-story apartments, duplexes, triplexes and fourplexes, which were mostly legal throughout Seattle before zoning laws were adopted in the 1950s, ’60 and ’70s, in parts of single-family zones near parks, schools and other services, and on corner lots. And, it advocates for banning McMansions, similar to new rules on Mercer Island, and allowing owners of existing large houses to convert them to duplexes. “My hope is, 10 to 15 years from now, single-family zones may not look a whole lot different but there would be more people living there,” Parham said. “We’re not talking about towers or even modest apartment buildings — we’re talking the type of buildings that already exist right now” because they were built before zoning laws. “We are currently reviewing the Commission’s report, and we look forward to listening to them, communities, and neighborhoods as we continue to build a more affordable and equitable Seattle,” said Kamaria Hightower, a Durkan spokeswoman. Any sort of changes to single-family zones is bound to encounter resistance. In 2015, then-Mayor Ed Murray unveiled plans to add more housing to single-family zones; the backlash was so swift that he canceled those efforts two weeks later. Right now, local density opponents are challenging and delaying plans to ease restrictions on homeowners’ ability to add backyard cottages and mother-in-law units, as well as a separate effort to upzone denser parts of the city and about 6 percent of single-family areas. It’s easy to see why: People who bought into quiet, suburban-style streets often did so because it provided the space, quiet and parking they craved, away from the hustle-and-bustle of downtown. While plenty of residents in those areas have come around to the idea of added density as they watch their kids grow up and be priced out of the city, the idea of changing neighborhoods midway through the game has not sat well with a lot of homeowners. Frank Fay, a member of the Wallingford Community Council, said existing zoning citywide includes plenty of room for more development in non-single-family zones. Parham countered that most of the commission members are homeowners and many live in single-family zones. The single-family zoning that dominates Seattle has priced people who aren’t rich out of most of the city’s neighborhoods, is contributing to income and racial inequality, and has forced the city’s booming population to crowd into small pockets of the city, a new planning-commission analysis concludes. The advisory report released Monday stops short of recommending major citywide density but advocates for some mild changes that could affect districts that are mostly detached houses now. For instance, it asks for more duplexes near schools, expanding the boundaries of urban villages by a few blocks and reducing lot sizes to squeeze more homes into streets. Like most cities, Seattle sets zoning rules that outline what can be built in different areas — from skyscrapers downtown and in South Lake Union to suburban-style homes with driveways in Magnolia and Crown Hill. Facing historic population and housing-cost growth, the city has allowed taller buildings and more housing in some of its dense neighborhoods near transit — think central Ballard or the Junction in West Seattle. But it’s kept single-family neighborhoods almost entirely unchanged: Residents in those areas dominate the electorate and many have been fiercely protective of keeping their neighborhoods the same, making any proposed changes there radioactive. Now, the planning commission’s report, a year-and-a-half in the making, is the first effort from City Hall in years to tackle the single-family zoning issue here. Cities from Minneapolis to Portland to Vancouver, B.C., are moving to allow denser housing like duplexes in single-family areas. • Single-family neighborhoods mostly accommodate high-income and white residents. As the median cost of a house has soared to $750,000, “making homeownership impossible for those with modest incomes,” single-family homeowners make more than twice as much as those living in other types of housing. The household income gap between renters and homeowners has grown from $43,000 a decade ago to $65,000 now. Only one-third of single-family-zone dwellers make below the city’s median income (compared to two-thirds of people living in the rest of the city) and the disparity could widen as soaring property taxes push poorer homeowners to sell. About half of white residents in Seattle own homes — while just one-fourth of black and Hispanic residents do. The commission argues a big part of the disparity is due to redlining and racial covenants, which decades ago prevented nonwhites from living in some desirable single-family zones, making it impossible for families of color to pass homes down through generations. Current zoning “perpetuates that legacy” by allowing only expensive housing there. • Growth in the city has been highly unequal because of zoning. Of Seattle’s 135 Census tracts, 31 have actually lost population since 1970 despite the city adding 180,000 people in that time frame. Almost all of the areas that lost residents were in single-family neighborhoods, often in upper-income areas close to the water where housing has not been added. For instance,the Madrona Beach (median home: $1.1 million) and Seward Park ($880,000) areas each lost about 750 residents. • Land use is unequal, as well. Although prior analysis has pegged single-family homes as making up about two-thirds of the city’s residential land, the report says 75 percent of land available for housing is reserved for single-family lots. When looking at all land in the city — including parks, streets, schools and businesses — 35 percent is used for single-family lots, compared to 12 percent for other types of housing. The report notes this creates an equity issue for families, as well, since nearly all of the city’s schools and parks are in pricier single-family zones. • Although concerns about “neighborhood character” aesthetics often frame debates about preserving single-family zones, buildings are in fact getting bigger in those neighborhoods. Because developers have been tearing down smaller, older homes in favor of large new ones, the average size of a new detached house in Seattle has soared 31 percent since 1990, from 2,660 square feet to 3,487 now. Those new houses are often one or two stories taller than neighboring houses and carry a median price tag far above $1 million. • Seattle’s housing stock is mostly either very dense (like high-rise apartments) or not at all (like a detached house). The so-called “missing middle” types in between — like duplexes, row houses and one-story apartment buildings — make up just 18 percent of all housing units. To be continued in next week’s blog…..